You say ‘touch’, and your dog locates and touches your flat hand with his nose. 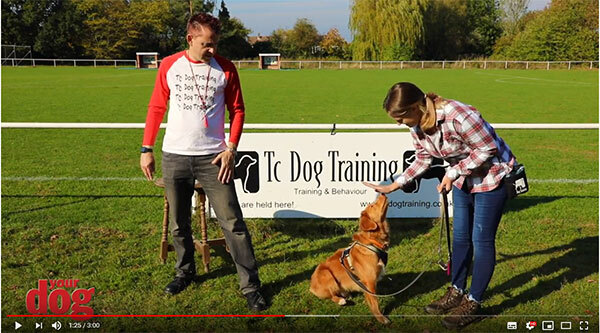 Apart from a neat trick to show-off with, this little exercise can stop your dog from running off or being distracted. It’s a great way to get your dog to face you. Place your hand anywhere and your dog will orientate towards it! It also informs your dog that hands predict good things… not collar grabs! In the early stages, place a treat or a piece of his dry food between your fingers. This is the prompt! As he sniffs it, he touches your hand. Say ‘good’ the second you feel his nose and then reward him with a piece of food in the other hand. Practice a few times before you stop using the food prompt. But you must still reward him! When do you add the word (cue) ‘Touch’? Get the actions right first and then add the word touch when you know it’s going to be successful. Your smart dog will soon pair up the word with the action! That's training! Have fun!